After you have successfully filed your income tax return, the next step is to verify it. The Income Tax Department starts processing your return when it is verified.The Income Tax department has given the option of verifying the return either electronically or physically (i.e by sending signed ITR-V to Centralized processing Center (CPC) in Bangalore). E-verification of the return is done by generating Electronic Verification Code(EVC). EVC is a 10 digit alphanumeric code which is sent to registered mobile number. It verifies the identity of the taxpayer. Step1 : Visit income tax e-filing website.Login to your account.If you do not have a account,then first register yourself. Step 2. : After logging in, select View Returns/Forms . Step 3:The following screen will appear.Select“Click here to view your returns pending for e-verification”tab to view the returns that are pending for verification. Then click on e-verify button. Step 4 : The following screen will appear. 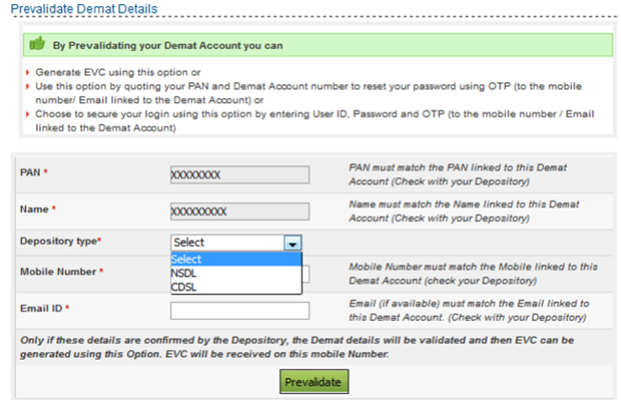 Select option 4 -Generate EVC through Demat Account Number. Step 6 : If the Depository Type is selected as NSDL, enter the DP Id, Client ID, Mobile Number, Email id and click Prevalidate. If the Depository Type is selected as CDSL, enter the Demat Account Number, Mobile Number, Email id and Click “Prevalidate”. Step 7 : On Pre-validation, the success page appears.Click “Yes” to generate EVC.EVC will be sent to the mobile number validated with the bank . Step 9 : Success message “Return successfully e-verified”will be displayed on the screen. Download the Acknowledgement’. This acknowledgement will also be sent to your registered email id. You have successfully e-filed and e-verified your income tax return.